sshreach.me allows you to expose your local web server to the Internet. Your local web server probably listens on port 80, or sometimes on port 8000. First, you need to create a client. 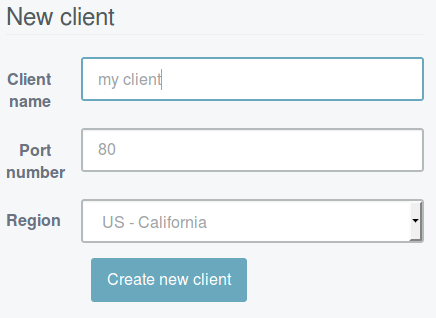 Fill in the name and port on the new client form. Your client will now appear in the client list. Click on the Script tab and from there you can download your activation script. Once your activation script is downloaded, you can start it with the python sshreach.me /path/to/your_private_key command. Once the client is activated, the client name will appear in green with a check mark next to it. You can now activate your tunnel through the web interface, by clicking on the Actions tab and clicking the button to On position. Once the tunnel is active, the client name will appear in yellow with a triangle icon next to it. While your tunnel is active, your service will be visible on the address shown on the Info tab in the Forwarding server column, and on the port in the port column. The column named Tunnel entry point will show the link to your service. You can close the tunnel by clicking the button to Off position.